I seem to go through gaming phases these days. Ever since Massive Chalice showed up in my Steam library, I’ve been simmering in Tactical RPGs. That’s why I was pleased to see Blackguards 2 come along. (The fact I’ve penned a short story for an anthology that is also called Blackguards is complete coincidence, honest). The version of the game reviews was pre-release, so any bugs or issues listed below could have been patched in the final release. The graphics of Blackguards aren’t an attempt at ultra-realism, but they’re above average on a number of levels. Let’s start with how the story is told. 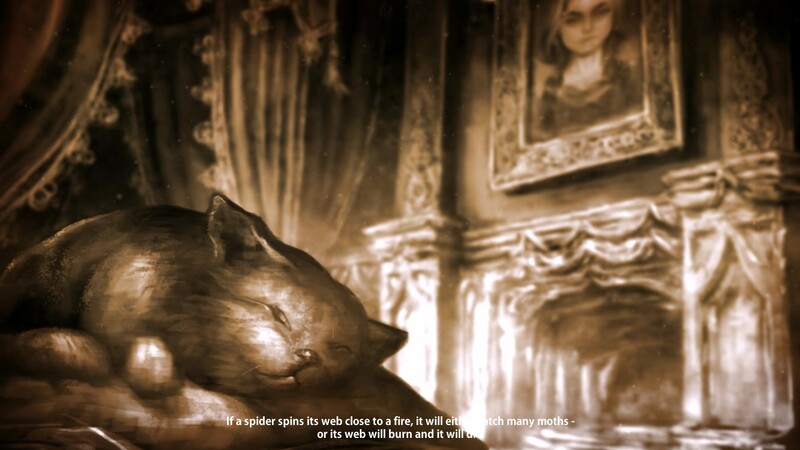 We’re greeted at the beginning of the game, and at various narrative milestones, by something that looks like a motion comic that was hand sketched on parchment. It’s an effective and striking visual style. A similar style, used to a lesser degree, is used to introduce each new mission. 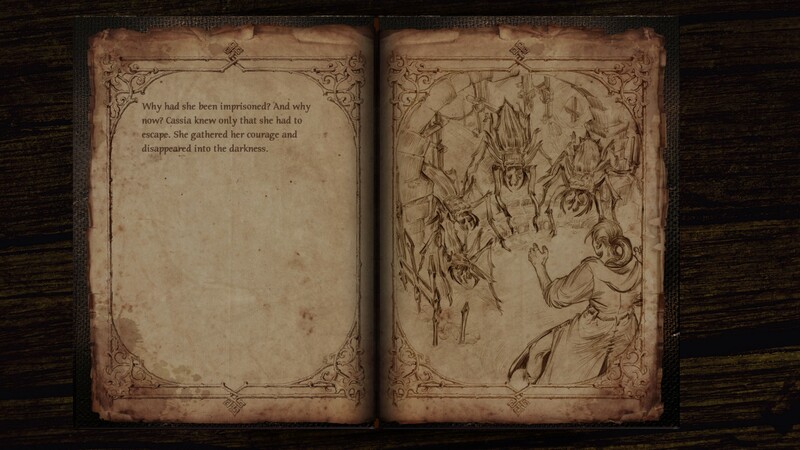 One of a handful of sketches greets you on the pages of an ancient tome while calligraphy explains the plot-importance of the individual missions. The actual gameplay graphics are extremely detailed as well. They aren’t photo-realistic, nor do I feel that they are attempting to be, but they are slick and polished. For instance, there is a significant number of armor options for each character, and adding them to the character changes the appearance of the character. Both spells and spell effects are clearly illustrated. Ice spells cover their targets with frost. Flame spells trail embers as they go. It’s worth noting that the details in the environments aren’t just for looking at, most of them have gameplay impact as well, but we’ll go into that in the next section. Look at all of those faces… This is going to be a long battle. At times I found there were some issues with the UI, though. Selections for combat actions and spells are made from a radial menu. You can bring this menu up anywhere, but for some reason I perpetually found myself bringing it up by right clicking on my character. In instances were an action couldn’t be targeted on myself, that was no problem, but in situations where it could, the result was always that I always cast beneficial spells on myself when I meant to choose a target later. More of personal issue, I realize, but it caused me problems. Making a list of valid targets available prior to moving a character would have been handy. Also, you can target a character by selecting the character model itself or the hex it is standing on, but since the model is moving, sometimes by the time you click, your target will have switched from the hex to the character in front of it. This is a fairly traditional tactical rpg, but they mix it up in a few interesting ways. The game is played on a level broken up into hex tiles. Each player character or enemy has an amount of initiative which determines at what point in every turn they are able to move. In this way the game is turn based, but rather than moving all of your pieces before turning over control to the opposing side, you each get a move each turn, and must keep an eye on the line of portraits along the bottom to determine who is moving and when. Terrain has an effect, mostly by effecting line of sight, which is obviously key for targeting, but also altering the probability of an attack connecting. The most important thing to keep an eye on in this game is the chance of success for a given attack, and it can change drastically with even minor positioning. Archers, for example, have a high probability to hit at medium to long range, but close range and extreme range causes the accuracy to plummet. There are also environmental hazards which can easily turn the tide of the battle. Swamp gas and oil slicks can be ignited with flame spells or flaming arrows. Rock platforms can be dumped on enemies. 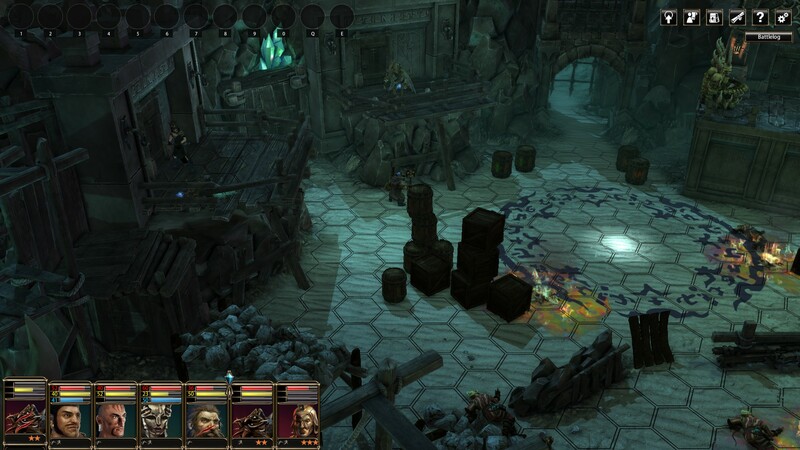 Piles of boxes can be dumped on foes to block their path or incapacitate them. Even bushes and assorted wooden debris can be ignited to cause damage to those who pass over or pause atop them. In some levels you’ll even be able to place such hazards to help you soften up invaders. I cant’ tell you how satisfying it is to blow up an oil barrel while it’s in the center of a cluster of idiots. Between missions, you’ll be presented with a map to select your next target. Aside from having varying difficulties, they offer assorted benefits for your force. Sometimes this means leveling up the mercenary troops who fill in the empty slots not occupied by your heroes. Other times you’ll get an upgrade across your entire force, or even a new type of troop. You’ll also get a chance to go back to your home base, where you’ll be able to cash in the points earned by your heroes after each mission. The number of options to spend points on is downright dizzying. Assorted weapon masteries, special talents, spells, special abilities. You can sculpt virtually any character into whatever sort of player you want. The only major differences to contend with are the base attributes and the inability for certain characters to cast spells. Yet another thing you can do is interrogate prisoners and discuss matters with your team. When you make decisions that matter, you’ll hear a little indicator noise and sooner or later that decision will come back to you. You might get information regarding how to best tackle a certain map, giving you new troop deployment options, for example. The presence of so many options makes it clear that replaying this game is likely to be a fairly unique experience each time. The music is appropriate for the fantasy setting, and the voice work is well above average. I particularly like the performances of the dwarf and the main protagonist. Naurim the dwarf was stereotypically gruff and surly, with some fairly unheroic leanings. Cassia the leader is teetering on the edge of sanity as well. (You often get a chance to talk to yourself, complete with choices of reply). In both cases the voice work developed the characters beautifully. The story is deep and nuanced enough to be a standalone novel. You play as Cassia, a woman cast into a labyrinth for four years. It costs her both her beauty and her sanity, and fills her with an overwhelming need to conquer the man who sentenced her. She puts together a group of less than angelic fighters, recruits a legion of mercenaries too intense for the man who gathered them in the first place, and they cut a bloody swath across the kingdom. Everything from the mythology to the magic system to the political system of this world seems fleshed out and detailed. I genuinely enjoyed it all. 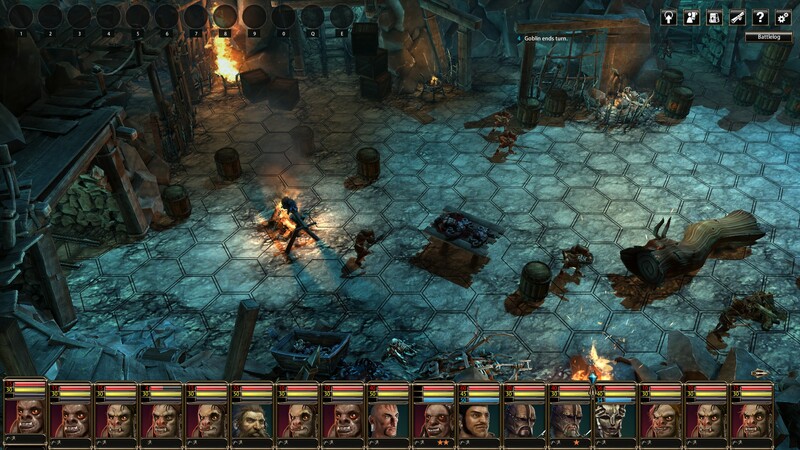 Blackguards 2 isn’t perfect, but it has the depth and strategy to give seasoned tactical RPG afficianados plenty of hours of enjoyment. 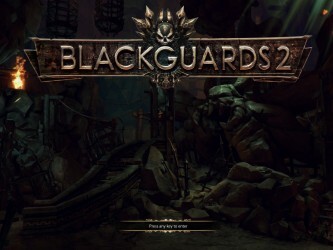 8.0 / 10: With the exception of some minor interface quirks, Blackguards 2 is a deep and entertaining Tactics RPG with plenty of replay value.